This is one of the two pedestrian bridges crossing Mülheim’s Dickswall, one of the busiest streets of the city. 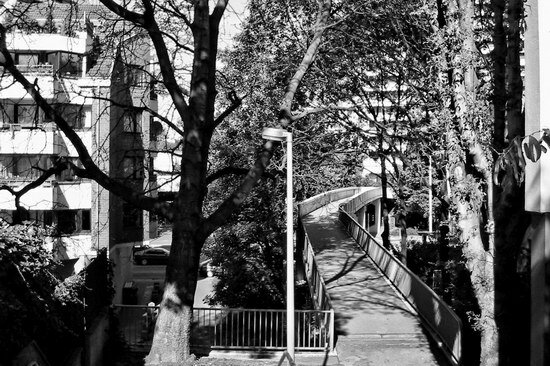 This bridge connects our neighbourhood with the area where the shopping center, the postoffice and the central railway, bus and subway station is. Again, you can see one of the ubiquitous highrises in the background. There are stairs leading down to the bridge from the street above – before the bridge was built together with the highrises and the first incarnation of the shopping center, there was just a path going down to the Dickswall called the Bocksberg, a name that has stuck until today and has become the official name of the little street. I’ll post a view back from the bottom of the stairs tomorrow!